It has been way too long since I have posted. I spent a lot of time last year solving a mystery on my father’s side of my tree with great results. Meanwhile, I moved to Portugal last Fall. It took a while to get settled in and then I have been traveling in the states since June. I will be back in Portugal in October and settled in one place starting November 1 for the next several months. My goal is to spend my winter getting organized about tracing one lead at a time. I will also be planning two genealogy trips for next year, June 2019 I want to spend some time in Maryland following up on Nicholas Moore, born in Maryland in about 1712. I will be on a quest to trace back from Nicholas and find where in Ireland my branch of the Moore family started their migration to America. In August and September 2019 I will be in Oklahoma for the First Families of the Cherokee Nation annual reunion (first time attending). Then to Mena, Arkansas where my great grandfather Moses Crittenden lived in the mid-1800s. Next to Guntersville, Alabama to the West side of my mother’s family. And then to South Carolina where I hope to be able to go further back in our lineage from William L West who was born in South Carolina and migrated to Alabama in the 1800s. Anyone with info on the Moores in Baltimore or Wests in South Carolina, please contact me. Over the summer I did manage to do some additional research on the time spent by my grandparents James Richard West and Eliza Crittenden West in Roswell New Mexico in the early 1900s. More court documents on my grandfather. Once I have a little more information I will post an update on the life of my very interesting grandfather! In Ireland researching my Moore family history from the 1600s I was reminded again that there are no shortcuts in discovering your genealogy and family history. On my father’s side I am very fortunate to have an 850 page resource researched and written by a cousin, Timothy J. O’Rourke, in 1973. “Maryland Catholics on the Frontier”, traces my Moore family lineage up the paternal line starting with Nicholas Moore born in Maryland in 1712. His father is listed as “possibly” William Moore. This very complete and well documented history amazes me every time I go back to it. In 1973 there were no quick answers via the internet and digital images. The book represents years of on the ground research and document searches. Since I started my quest to find more about my mother’s ancestors, Crittenden and West, I have also been able to add to my knowledge of the Moore family with online digitalized copies of birth and death certificates, marriage licenses and other documents verifying the research already done. Our family’s oral history tells me that our ancestors immigrated to the United States in the Maryland area from Ireland in the 1600s. Not finding any definitive information online I got it into my head that a visit to Dublin (I was going to be in Europe already) and the genealogy department of the National Library of Ireland might provide some clues. I was blown away by the antiquities available to research in their manuscripts sections, land documents from the 1500s and 16oos and even earlier. However, I quickly realized that I was trying to make a very difficult leap from Maryland back to Ireland without enough information. I had thought maybe studying manuscripts with Irish Moore genealogies from the 1600s would provide me the clues that I needed. I did indeed find some genealogies with similar family naming patterns but none that mentioned family members moving to the United States in the correct time period. I found documents with given and family names that could be a match to my family, but without enough detail to make a connection. I met with a genealogist in at the National Library. She reminded me of what I really already knew. I was trying to skip a step. If I could not find what I needed about my Maryland ancestors online I needed to start in Maryland, on the ground, visiting libraries, court houses, churches and scouring documents in person. In my quests for more information in both my Crittenden and West lines I already knew that my key links, when I was stuck, were found by going to Oklahoma and Arkansas and spending weeks examining papers that I could only access in person. Hours, sometimes days, spent finding nothing only made the reward that much greater when I would find a key piece of the puzzle of my family’s history when I was least expecting. Often when I was on the last piece of paper after four to five hours in a library or court house I would find my great reward. I am already scheduled to go to Oklahoma, Arkansas and Alabama in the fall of 2016 for the next step in Crittenden and West research. I now know that what I need to schedule next is a trip to Maryland to immerse myself in the Moore history of the 1600s and early 1700s. I am confident that by remembering that I have to go back one step at a time, and that skipping a generation can lead to false assumptions, I will find the next missing piece in the link from Maryland to Ireland for my Moore ancestors. Once I find that link I will go back to Ireland and search once more through hand written Moore family trees and land documents, like the one below with its awesome seal. When I do, I hope to be able to piece together the story of my family in Ireland. This will be a brief entry as I am currently traveling outside of the United States. It is difficult to tranfer images and post while traveling. However, I am still researching whenever possible while I am traveling. So, for now, I can only tantalize readers with a note about a blog to come, in the next few weeks. I have just located some newly indexed records of Fort Smith, Criminal Case Files, 1866-1900. Included in these files are court proceedings from the late 1860s involving Moses Crittenden and a charge from the United States that he had provided “spirits” to an “Indian”. Once I am somewhere where I can download and study the many pages of documents I will post an article about what I find. I think I may be close to an answer as to the timing of why Moses relocated from Arkansas to Oklahoma when he did. This is one of the many research questions that have puzzled me and for which I did not think I would ever have an answer! More info to come as soon as I have the ability to download and post. Last week I wrote about finding a copy of the land patent for the land my great grandfather, Moses Crittenden, purchased in 1860 in Polk County, Arkansas. As soon as I held the description of the land in my hand I knew I would find my way to Arkansas and stand on that land. On November 1, 2014 I fulfilled the promise made to myself and drove into Mena Arkansas, county city for Polk County. It was too late in the day to visit the court house or library. So, after a great meal at the Skyline Café in the center of town, I checked into my motel for a good night’s sleep in anticipation of a full day of researching starting early the next morning. I was waiting on the court house steps the next morning anxious to find a map that matched the legal description on the land patent. 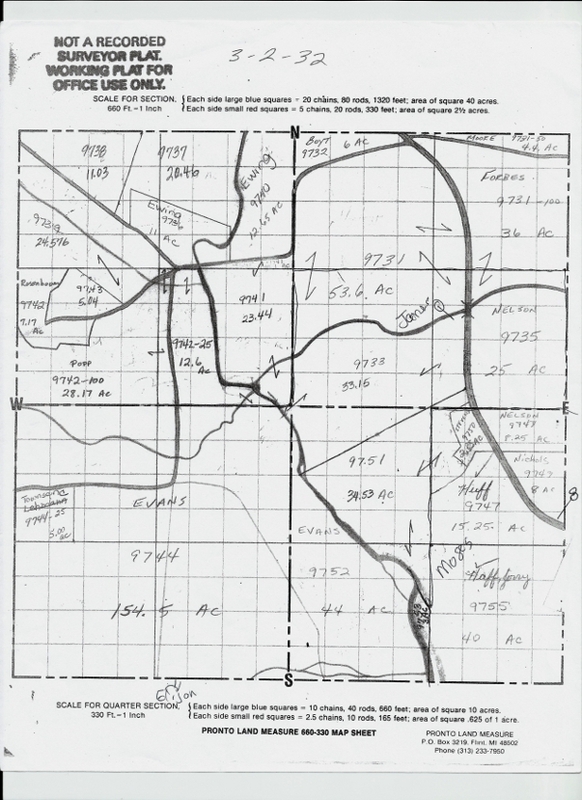 The clerk was able to provide me with a map that had the current owner’s names written on a plat map for the appropriate township and range. Using a map hanging on the wall of the county clerk’s office she pointed out some landmarks that would help me know when I reached the property. 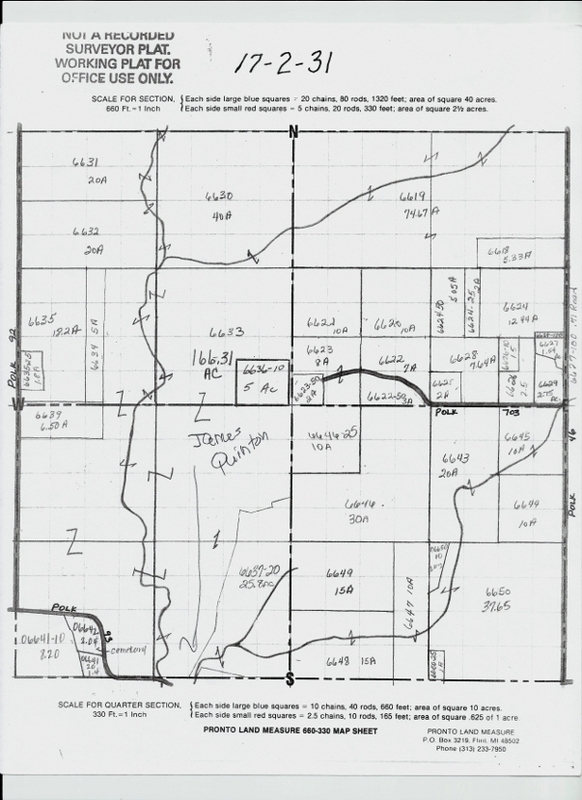 The clerk also provided me with a plat map showing the current owners of the neighboring land. I wrote in the location of Moses original homestead and a few of his relatives on the plat maps and started my drive. When I reached the curve in the road that I thought signified I was at Moses’ property I was very glad that I had the map with the current owner’s name. The last name of the current owner is Huff. At the entrance to the farm that I thought was on Moses’ old homestead was a large iron gate with a large “H” on it. Obviously H for Huff. I was in the right place. Coming later this week, the surprising discoveries I made later that day at the Polk County Library in Mena. My search for Cherokee Roots in Arkansas began with the 1850 and 1860 census data that showed my great grandfather Moses Crittenden residing in Freedom Township, Polk County, Arkansas. Moses was born in Cherokee Nation Georgia around 1825 and moved to Arkansas with his father William some time before 1837. I knew that he was living in Going Snake District in Cherokee Nation, Oklahoma Territory by 1875 when my grandmother was born. I was determined to find out more about those years spent in Arkansas. In the 1850 census Moses is listed as a farmer, and in 1860 as a merchant. Many of his neighbors were in-laws of his sisters Lydia and Sydney Crittenden. One thing that caught my eye on the 1860 census was that Moses was shown to have real estate valued at $2000. After much searching on the web I found my way to the Bureau of Land Management website where you could search land records by state going back to the 1800s. I selected Arkansas state and Polk County, entered Moses Crittenden and hit the search button. I hit pay dirt! I clicked on the link highlighted in blue and was able to view a full description of the property. Next I clicked on the tab “Patent Image” and was able to view a printable PDF version of the land patent. I added that item to my cart and for $2.00 was sent a certified copy of the patent on parchment paper. Using the description of the land and current land records I was able to determine that Moses’ land was near the current town of Mena, Arkansas. I knew that I had to see and stand on that land. 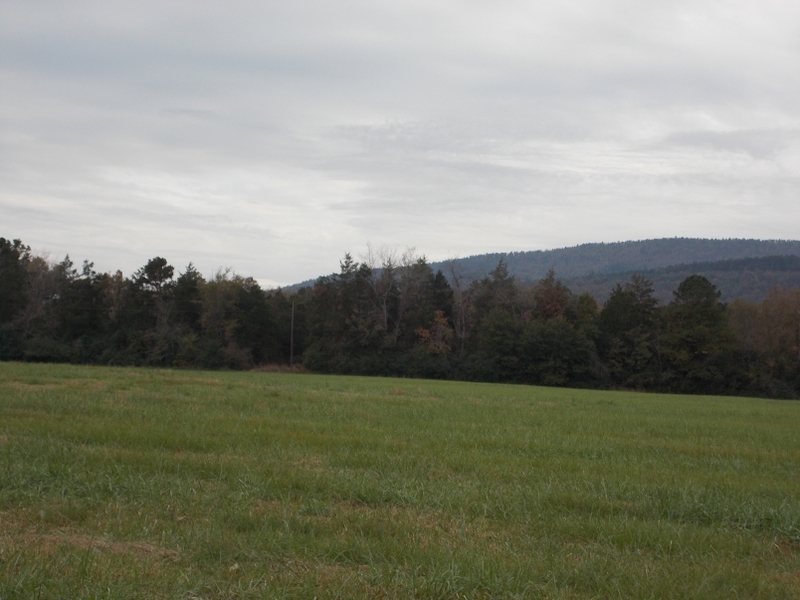 Next week – the discoveries I made on my trip to stand on my great grandfather’s land in Arkansas.